That festive time of year called the winter holidays is a beguiling mix of fire and ice. As in the old days, fires burn day and night along the streets of Colonial Williamsburg, Virginia. For the tourist who visit when the temperature dips to 16 degrees and the wind whistles through the trees, the fires offer a welcome respite. Especially around Thanksgiving and Christmas, Williamsburg glitters. The colonial town decks out for this special season. Its most sumptuous hotels feature true-to-the-colonial period decorations: wreaths fashioned from local trees, sporting fruits and vegetables. Every door has some sort of decoration. Inside restaurants and taverns, the trend towards finery runs even deeper. You’ll find luscious seasonal flower arrangements, linens with holiday sparkle and seasonal drinks and foods. Every visitor to Williamsburg literally should make the time to eat, drink and be merry. Take a carriage ride. If you’re lucky, you’ll get what I got: a carriage driver with 29, maybe 30, years of experience under his or her belt. He’ll point out what you must absolutely see and do and fill in details not available in promotional brochures. ‘Because it’s safe; because there are craft and skill demonstrations from silversmithing to weaving; because its actors stay In character; because it has a lovely spa and multitudes of shopping choicesâ€• Williamsburg can be a holiday travel destination for everyone from singles to couples to families with small children. Beginning in late November, there are special concerts, exhibits, historical programs, seasonal lighting displays and other events. 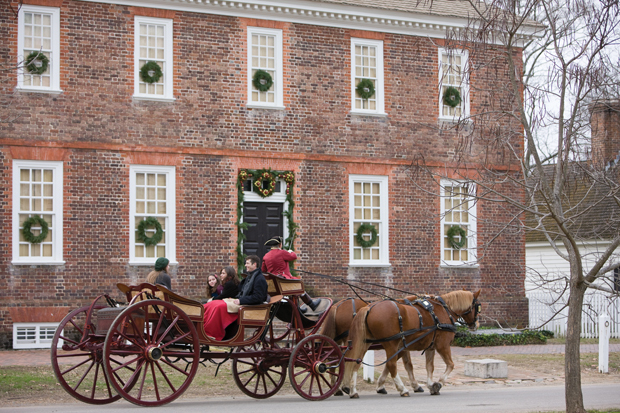 With a ticket to Colonial Williamsburg, the visitor can take in more than 40 historic trades and sites, meander through two world-class art museums and embrace the season with heart-warming holiday events. And what little one wouldn’t be excited to see a Leicester Longwood sheep? Colonial Williamsburg’s Rare Breed programâ€•initiated in 1986â€•was designed to preserve such genetic diversity in livestock. According to historical research, some breeds in the program represent animals that might have been present in the town in the 1700s. The rare breeds program complements the town’s living history legacy, offering a bird’s eye view of another feature of daily life in colonial Virginia. To be classified as rare, a breed must have less than 1,000 animals registered annually in North America. Breeds in the program include American Cream Draft horses and American Milking Red Devons. From animals to actors, at Williamsburg, your trip back in time is underscored at every turn. The actors who play the tavern owners, the postmistress or postmaster, the soldiers, the sellers with assorted wares at the colonial market, understand that part of the fun of going back in time is staying there. So there’s an old-timey lilt in their voices. Their costumes are planned to perfection. And their wares, well they’re stupendous. You’ll find tempting silver pieces, children’s toys, rose-scented powder like that used in colonial times, even special chocolate just like it was made three centuries ago. Residents who live in the historic town participate in a contest for the best door decorations. And the walking tours of the decorated areas are popular with tourists. So is lodging in Colonial Williamsburg and the carriage rides. Even being cold on a carriage ride didn’t dampen Exum’s enthusiasm. When your feet wear out and you’re too cold (or too tired) to delve more deeply into colonial history, dive into one of Williamsburg’s many restaurants. The town’s taverns are perfect for a casual lunch. At Chowning’s Tavern, the idea is to evoke the fun and rowdy atmosphere of a traditional 18th century tavern. For example, you might want to sample a root beer, a beef shepherd’s pie, and a cup or a bowl of roasted corn chowder. For more serious drinking, try the specialty beers with enticing names like Old Stitch and Dear Old Mum. There are loads of quick stop eateries beyond the colonial town. And within the town itself, choices for family dining or a couple’s evening out abound. In actuality, Williamsburg is two towns rolled into one. There’s the town that surrounds the recreated colonial town and there’s Colonial Williamsburg itself. The colonial town transports you back, charming even the cynical with its period landscaping, homes and conveyances. In the colonial section, walking is your best transportation option, though you can rent scooters – even some suitable for the disabled and the slow moving. And if you stay on site at either the Williamsburg Inn, Williamsburg Lodge, Providence Hotel Guesthouses, Williamsburg Woodlands Hotels and Suites or the Governor’s Hotel, your guest benefits include unlimited shuttle use in and around the Revolutionary City and loads of other discounts. A “great place for kids,” one visitor said of Williamsburg, stressing that youngsters get to actually experience in the colonial town the history that they study in school. Another said that though a multi-day admission pass to Williamsburg may be expensive, you can see and experience so much that it’s worth it.